Retina-Vitreous Consultants (RVC) is a premier ophthalmology subspecialty practice in New Jersey. Founded almost 30 years ago, RVC continues to provide expert consultation and personalized care in the diagnosis and treatment of retinal, vitreous, and macular diseases. Doctors in Northern New Jersey, Eastern Pennsylvania, and Southern New York State refer their patients to RVC for expert evaluation and treatment. RVC physicians have been selected as The Best Doctors in New York Magazine and Top Doctors in New Jersey Monthly Magazine. They have also been featured as Top Doctors in Castle Connolly Reports and selected as Best Doctors in America and Top Ophthalmologists in America. Retina-Vitreous Consultants’ scope of practice is limited to consultation, laser surgical intervention, and intraocular surgical rehabilitation of vision loss secondary to diseases of the retina, vitreous, and macula. 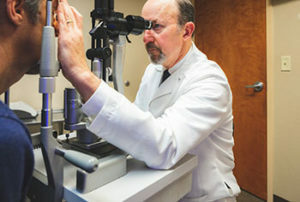 These conditions include diabetic eye disease, macular degeneration, retinal tears and detachments, ocular inflammation (uveitis), macular surface anomalies, such as macular holes and puckers, retinal vascular diseases, and hereditary and juvenile retinal degenerative conditions and dystrophies. Our Retinal Imaging Center offers digital real time fluorescein and ICG angiography, ocular ultrasound, and optical coherence tomography (OCT) for immediate review by Dr. Kanter to determine a patient’s course of treatment. OCT is an invaluable tool in the diagnosis of retinal disease and allows for two-dimensional quantitative and volumetric analysis of a patient’s clinical response to laser, surgical, and pharmaco-therapeutic treatments. Retina-Vitreous Consultants is an active participant in national collaborative clinical research trials investigating the effects of various drug therapies, laser modalities, and surgical interventions in the treatment of patients with diabetic retinopathy and macular degeneration. We have been recognized by our peers for our expertise in being the only retinal practice in Northern New Jersey to be certified by the world renowned Harvard affiliated Joslin Center for Diabetes in Boston. To schedule a consultation with Dr. Kanter or to learn more about our practice, services, or an individual’s potential eligibility for enrollment in any of our current clinical research protocols, please call 973.716.0123. Eric D. Kanter, M.D. is a graduate of Columbia University and the Albert Einstein College of Medicine. He completed his training at the Scheie Eye Institute of the University of Pennsylvania School of Medicine. Dr. Kanter was awarded the prestigious Fight for Sight Research Fellowship at the Yale University Eye Center. 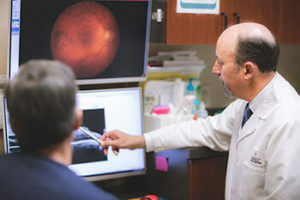 His expertise includes both the surgical repair of complex retinal detachments and the diagnosis and treatment of both diabetic retinopathy and macular degeneration. He has been a Member of the Board and Chief of the Ophthalmology Service at the Short Hills Surgery Center in Millburn, NJ, and attending surgeon at Saint Barnabas /Robert Wood Johnson Medical Center in Livingston, NJ. Dr. Kanter has multiple publications in the peer-reviewed literature. He is a frequent lecturer and consultant to both professional groups and industry on recent developments in the treatment of retinal, macular, and vitreous disorders. He has been a Principal Investigator in multiple national clinical research trials investigating the use of novel pharmacological agents and surgical techniques in the treatment of macular degeneration and diabetic eye disease. He is a member of scientific advisory boards to both established multinational and early-stage pharmaceutical companies in the Ophthalmology space. Throughout 25 years of clinical practice, Dr. Kanter has contributed to the advancement and refinement of the practice of ophthalmology and vitreoretinal surgery in New Jersey. He takes great pride in the care he provides to his patients and their families, explaining sometimes complex diagnostic evaluations, and ensuring that they have a thorough understanding and sense of comfort and confidence in their treatment plan. Surgical Coordinators Left: Abbie P., Right: Linda N.
Ophthalmic Technicians Back Row, Left to Right: Kerri J. and Lindsey B. Front Row Left to Right: Laura L., Roxana C., and Linda G.